Nokia reported an increase in sales for the first quarter, but profit declined and the company expects a challenging second quarter as it bears the full brunt of component shortages resulting from the earthquake in Japan. Sales for the quarter totalled €10.4 billion (US$15.2 billion as of March 31, the last day of the period reported), up 9 percent compared to a year earlier, helped by favorable exchange rates. However, year-on-year, net profit dropped from €349 million to €344 million. The two big events during Nokia's first quarter was the announcement that it will move to Microsoft's Windows Phone as its main smartphone operating system and the earthquake in Japan. Nokia and Microsoft have now signed a definitive agreement. Microsoft will receive a royalty payments from Nokia for the Windows Phone platform, starting when the first Nokia products ship. Nokia will contribute mapping, navigation, and some location-based services to the Windows Phone ecosystem, and will receive payments "in the billions of dollars," Nokia said in a statement on Thursday. The two companies have also made "significant progress on the development of the first Nokia products incorporating Windows Phone," the statement said. 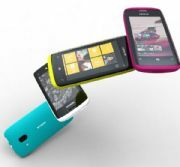 Nokia's goal is to start shipping larger volumes of Windows Phone-based smartphones in 2012. Nokia also plans to launch its own application store, where developers will be able to sell apps for Windows Phone, Symbian and Series 40 devices, it said. Before the arrival of the first Windows Phone-based smartphones Nokia will have to rely on its existing platforms, including struggling Symbian -- for which the company continues to develop and release products currently. The company sold 108.5 million phones during the first quarter, including 24.2 million smartphones; up 1 percent and 13 percent year-on-year, respectively. That resulted in Nokia's overall market share dropping to 29 percent in the first quarter, down from an estimated 33 percent in the first quarter of 2010. The company's smartphone market share dropped from 41 percent to 26 percent, according to preliminary estimates from Nokia. The impact of the Japanese earthquake on sales was small during the first three months of 2011, according to a spokesman. But it will have a negative impact on Nokia's sales not only during the second quarter but also through the third quarter, at least, it said. Earlier this week, Sony Ericsson also highlighted problems it is facing as a result of the quake in the coming quarters. Nokia's average sales price mobile per phone was €65 in the first quarter, up from €62 year-on-year, helped by the growth in smartphone sales. But at the same time, the average sales price per smartphone dropped by 6 percent to €147 during the same time period, thanks to general price erosion and an increase in the number of cheap converged mobile devices.